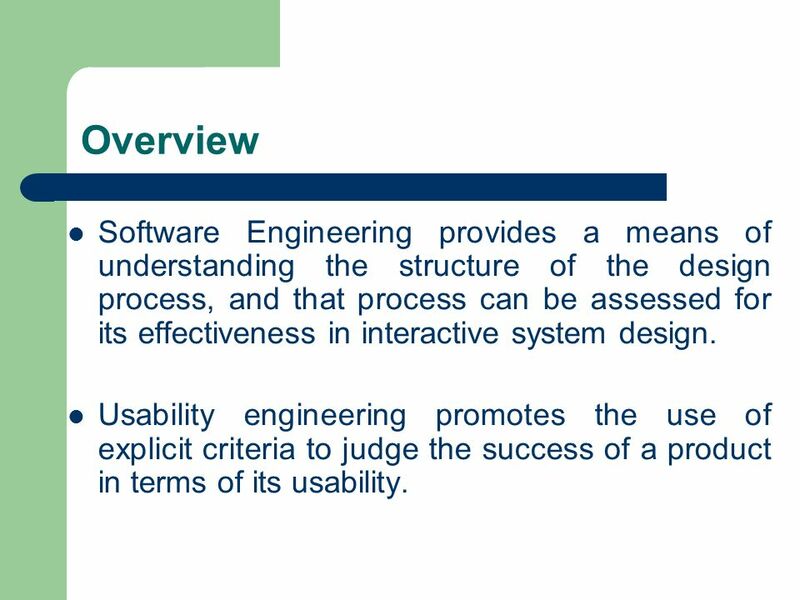 2 Overview Software Engineering provides a means of understanding the structure of the design process, and that process can be assessed for its effectiveness in interactive system design. Usability engineering promotes the use of explicit criteria to judge the success of a product in terms of its usability. 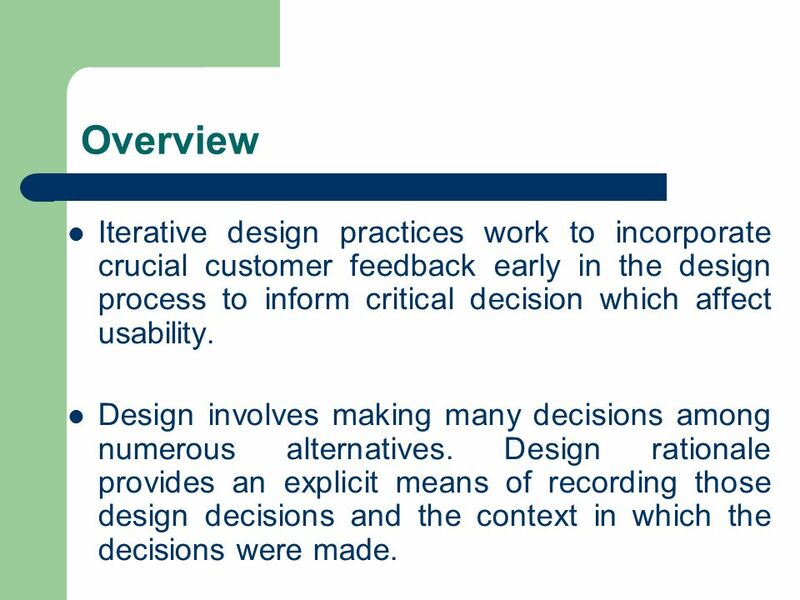 3 Overview Iterative design practices work to incorporate crucial customer feedback early in the design process to inform critical decision which affect usability. Design involves making many decisions among numerous alternatives. Design rationale provides an explicit means of recording those design decisions and the context in which the decisions were made. Requirements Specifications The designer and customer try to capture a description of what the eventual system will be expected to provide. Involves work environment (domain). Architectural Design Concentrate on how the system provides the services expected from it. Provides a decomposition of the system description that allows for isolated development of separate components which will later be integrated. Detailed Design Refinement of the component description provided by the architectural design. The behavior implied by the higher-level description must be preserved in the more detailed description. The detailed design for a component of the system should be in such a form that it is possible to implement it in some executable programming language. Coding & Unit Testing After coding, the component can be tested to verify that it performs correctly, according to some test criteria that were determined in earlier activities. 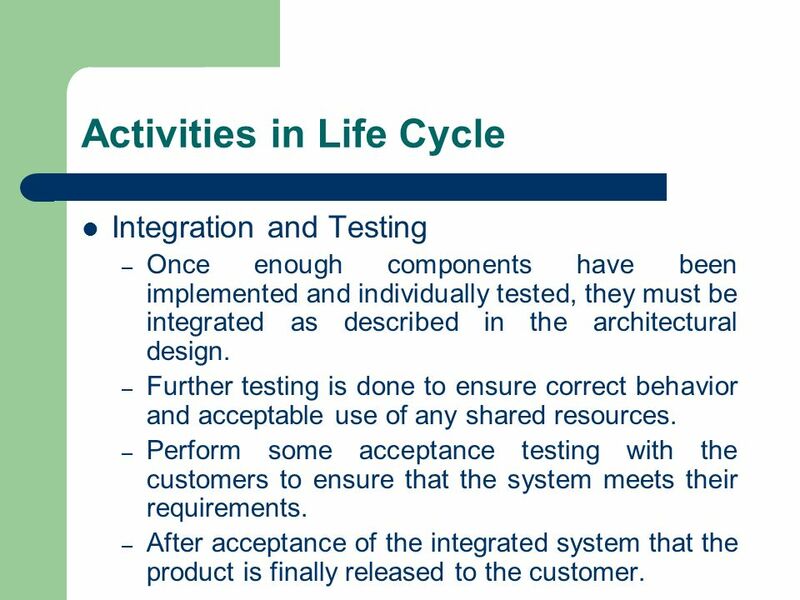 Integration and Testing Once enough components have been implemented and individually tested, they must be integrated as described in the architectural design. Further testing is done to ensure correct behavior and acceptable use of any shared resources. Perform some acceptance testing with the customers to ensure that the system meets their requirements. After acceptance of the integrated system that the product is finally released to the customer. Maintenance After product release, all work on the system is considered under the category of maintenance, until such time as a new version of the product demands a total redesign or the product is phased out entirely. 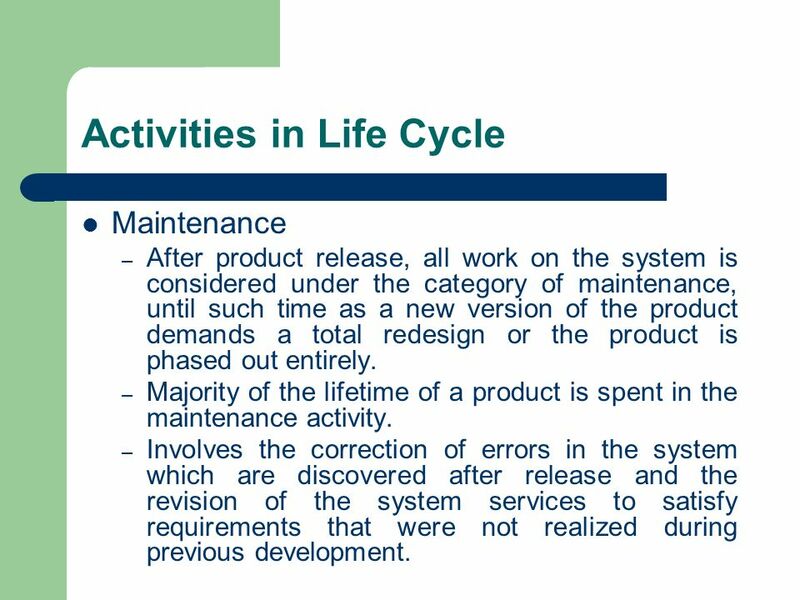 Majority of the lifetime of a product is spent in the maintenance activity. Involves the correction of errors in the system which are discovered after release and the revision of the system services to satisfy requirements that were not realized during previous development. 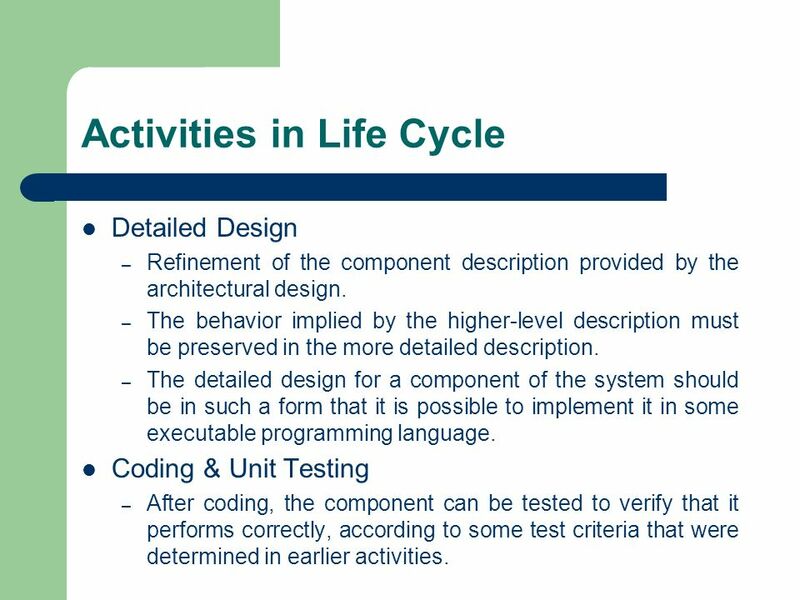 Throughout the life cycle, the design must be checked to ensure that it both satisfies the high-level requirements agreed with the customer and is also complete and internally consistent. 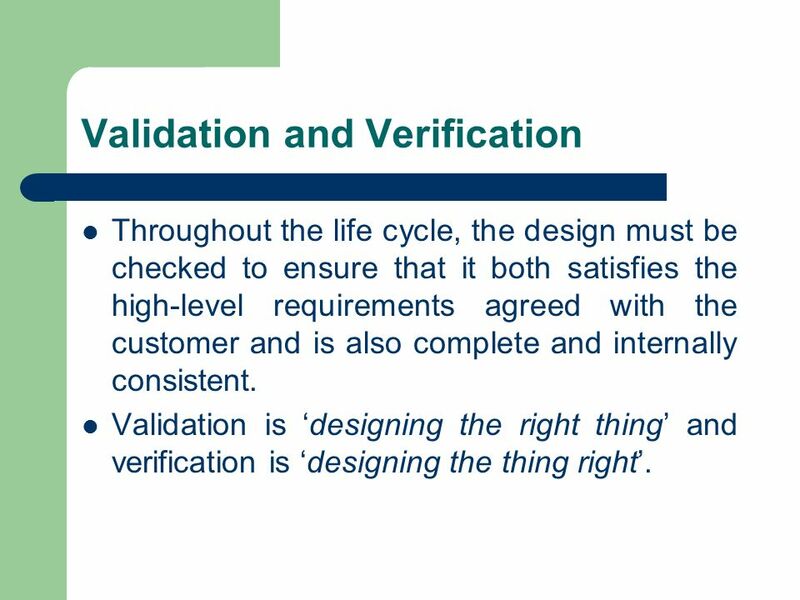 Validation is ‘designing the right thing’ and verification is ‘designing the thing right’. 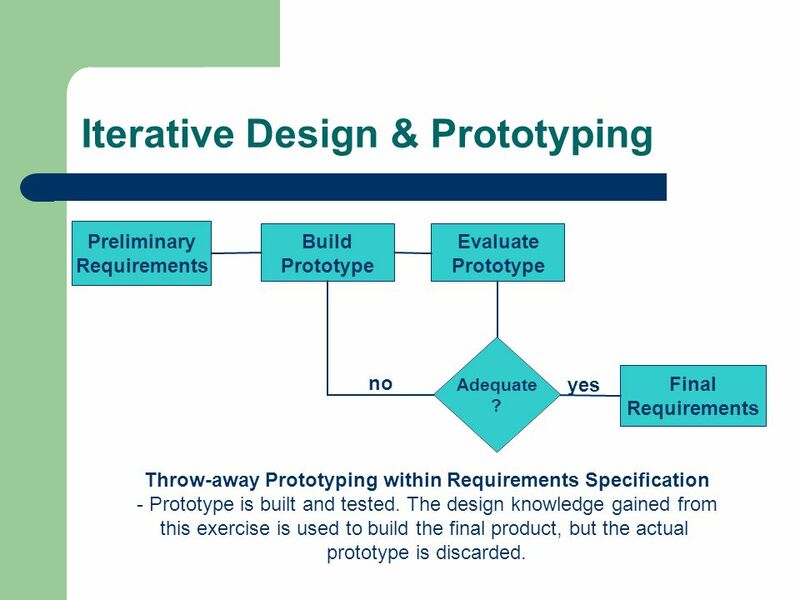 Throw-away Prototyping within Requirements Specification Prototype is built and tested. The design knowledge gained from this exercise is used to build the final product, but the actual prototype is discarded. 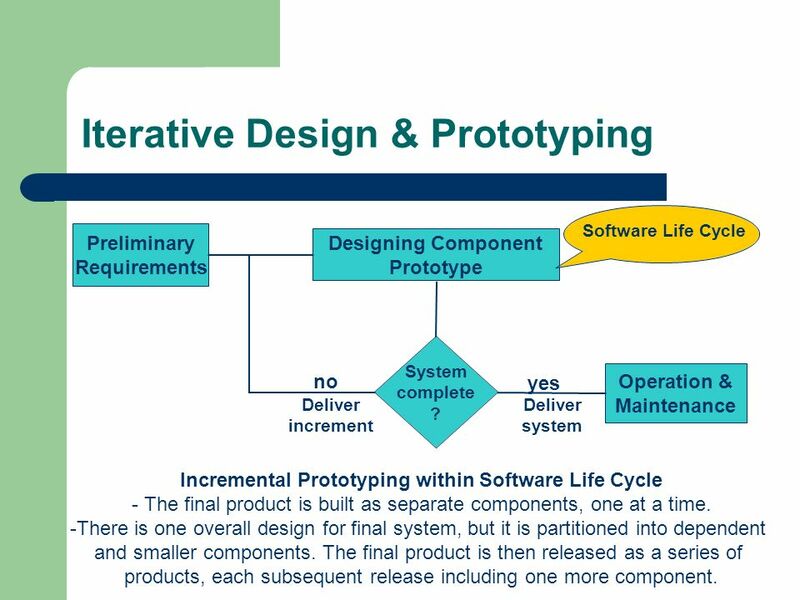 Software Life Cycle Incremental Prototyping within Software Life Cycle The final product is built as separate components, one at a time. There is one overall design for final system, but it is partitioned into dependent and smaller components. The final product is then released as a series of products, each subsequent release including one more component. 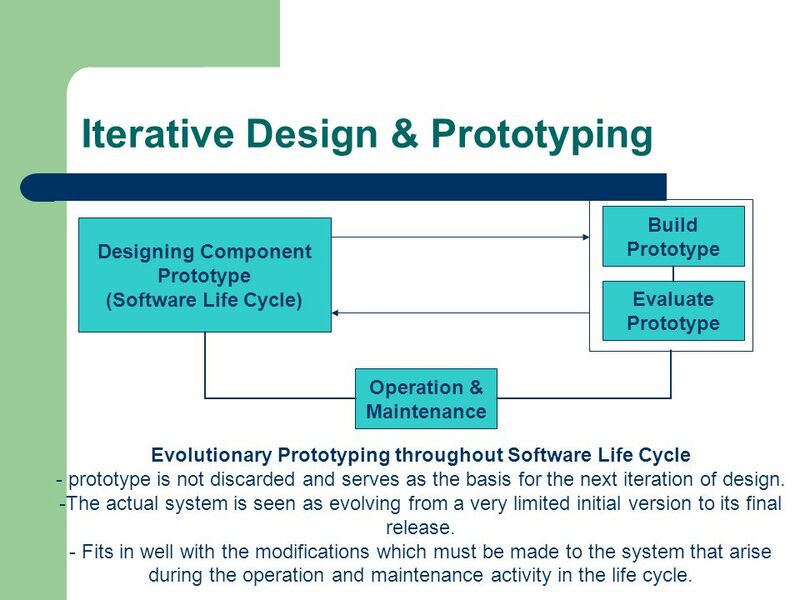 Evolutionary Prototyping throughout Software Life Cycle prototype is not discarded and serves as the basis for the next iteration of design. The actual system is seen as evolving from a very limited initial version to its final release. - Fits in well with the modifications which must be made to the system that arise during the operation and maintenance activity in the life cycle. Rapid Prototypes Storyboards Simplest notion of prototype. A graphical depiction of the outward appearance of the intended system, without any accompanying system functionality. 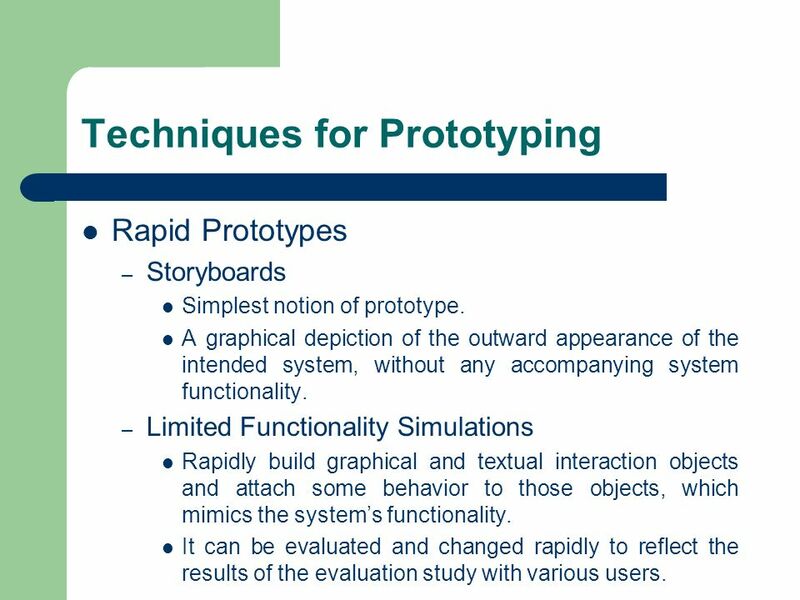 Limited Functionality Simulations Rapidly build graphical and textual interaction objects and attach some behavior to those objects, which mimics the system’s functionality. It can be evaluated and changed rapidly to reflect the results of the evaluation study with various users. 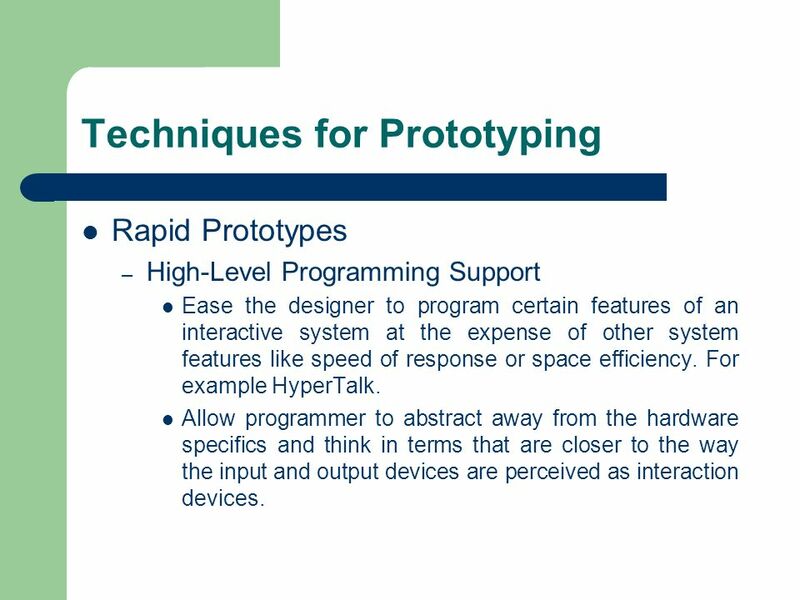 Rapid Prototypes High-Level Programming Support Ease the designer to program certain features of an interactive system at the expense of other system features like speed of response or space efficiency. For example HyperTalk. Allow programmer to abstract away from the hardware specifics and think in terms that are closer to the way the input and output devices are perceived as interaction devices. The ease with which new users can begin effective interaction and achieve maximal performance. 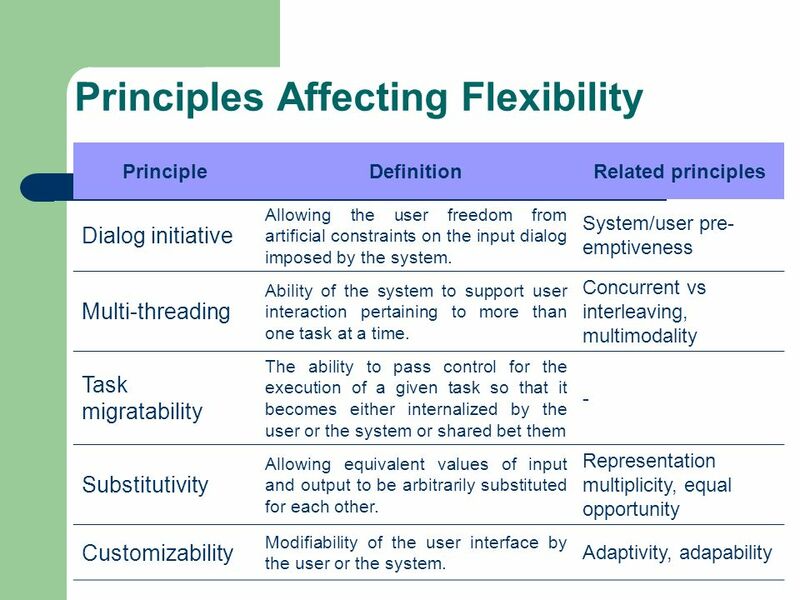 Flexibility The multiplicity of ways in which the user and the system exchange information. 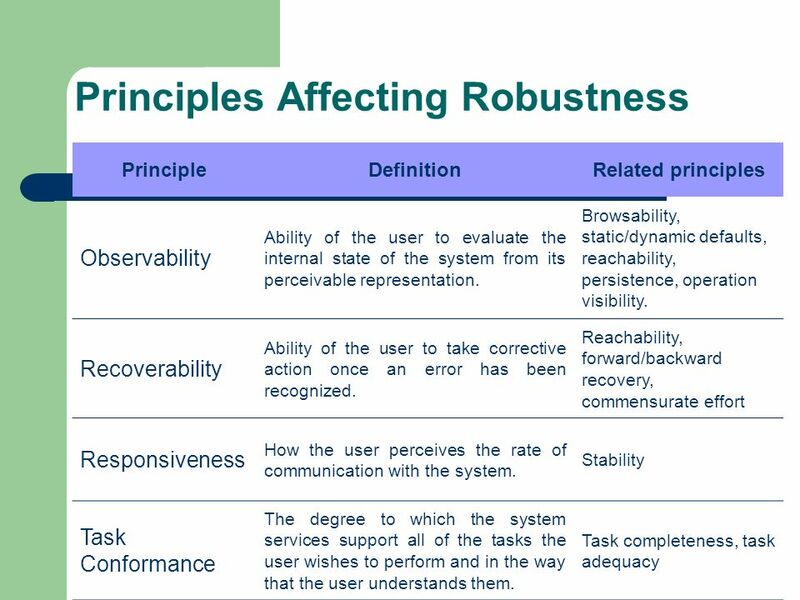 Robustness The level of support provided to the user in determining successful achievement and assessment of goals. 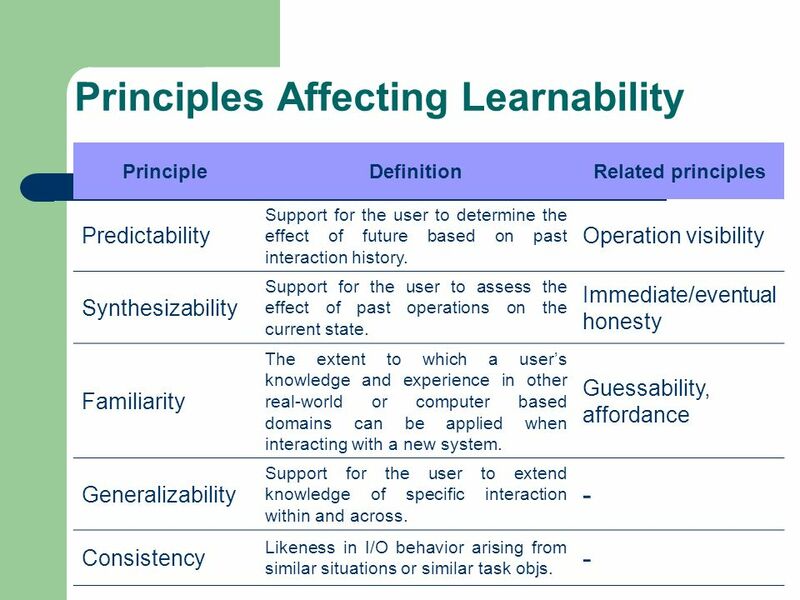 Definition Related principles Predictability Support for the user to determine the effect of future based on past interaction history. Operation visibility Synthesizability Support for the user to assess the effect of past operations on the current state. Immediate/eventual honesty Familiarity The extent to which a user’s knowledge and experience in other real-world or computer based domains can be applied when interacting with a new system. Guessability, affordance Generalizability Support for the user to extend knowledge of specific interaction within and across. - Consistency Likeness in I/O behavior arising from similar situations or similar task objs. Strive for consistency in action sequences, layout, etc. Enable frequent users to use shortcuts. 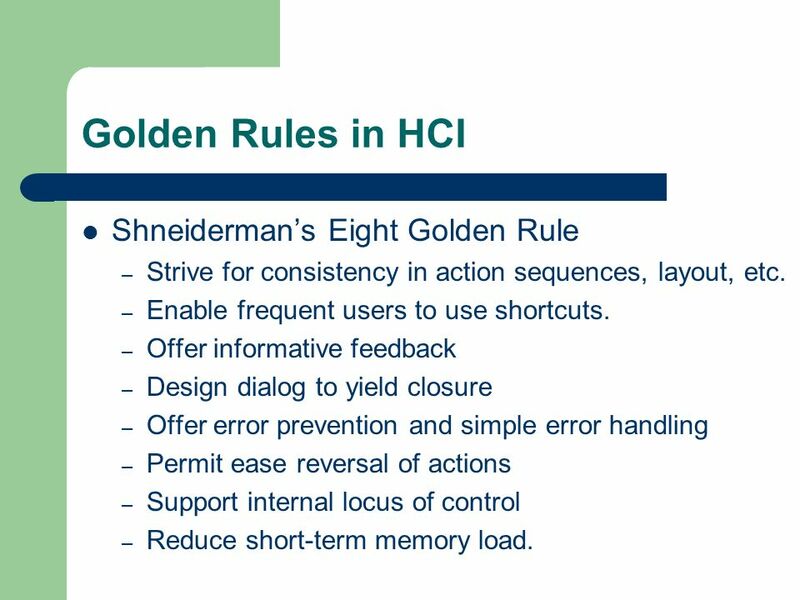 Offer informative feedback Design dialog to yield closure Offer error prevention and simple error handling Permit ease reversal of actions Support internal locus of control Reduce short-term memory load. 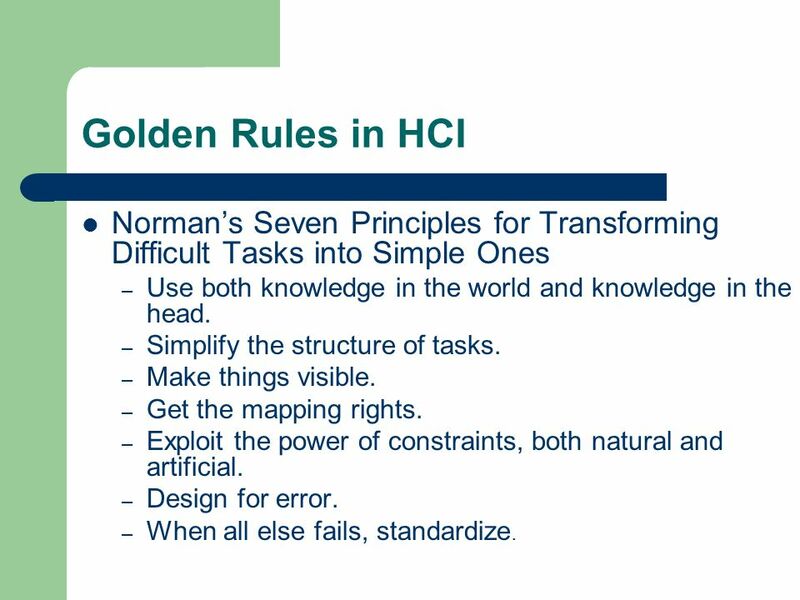 21 Golden Rules in HCI Norman’s Seven Principles for Transforming Difficult Tasks into Simple Ones Use both knowledge in the world and knowledge in the head. Simplify the structure of tasks. Make things visible. Get the mapping rights. Exploit the power of constraints, both natural and artificial. Design for error. When all else fails, standardize. Download ppt "HCI in the Software Process and Design Rules"
Interaksi Manusia Komputer – Marcello Singadji. 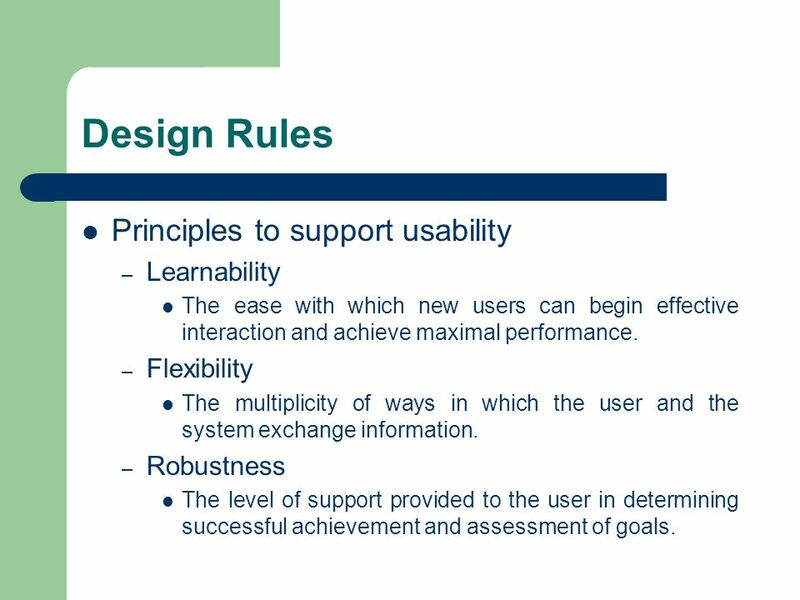 design rules Designing for maximum usability – the goal of interaction design Principles of usability. 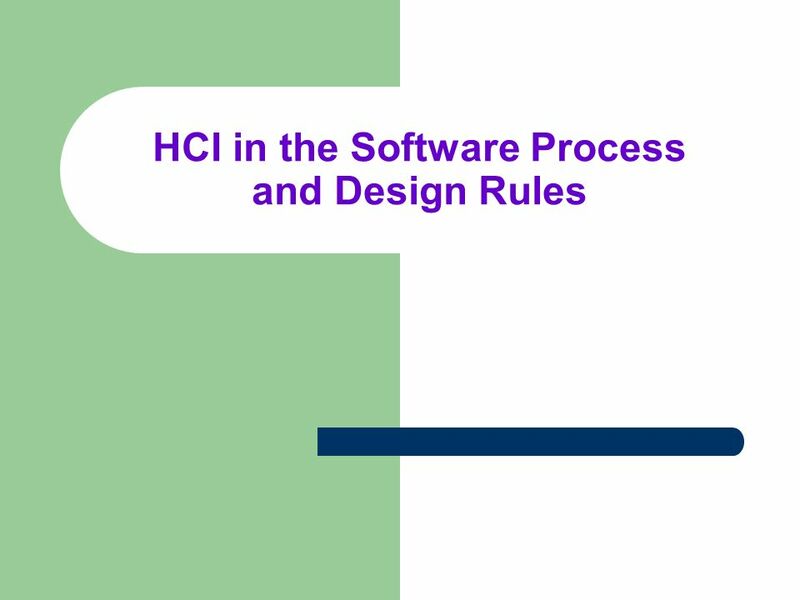 Chapter 6 HCI in the software process. 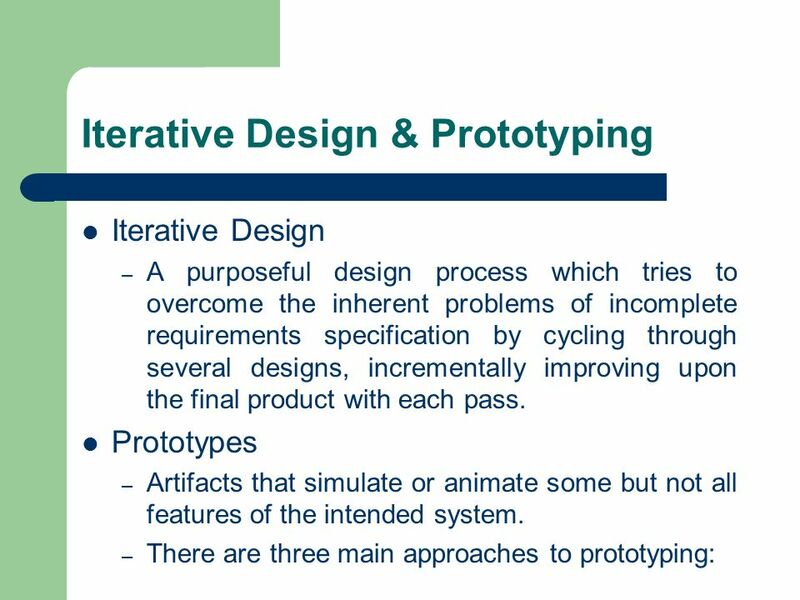 Software engineering and the design process for interactive systems Usability engineering Iterative design and. ©Ian Sommerville 2004Software Engineering, 7th edition. Chapter 4 Slide 1 Software Processes. The System and Software Development Process Instructor: Dr. Hany H. Ammar Dept. of Computer Science and Electrical Engineering, WVU.  2004 by SEC Chapter 2 Software Development Process Models. What is Software Design?. 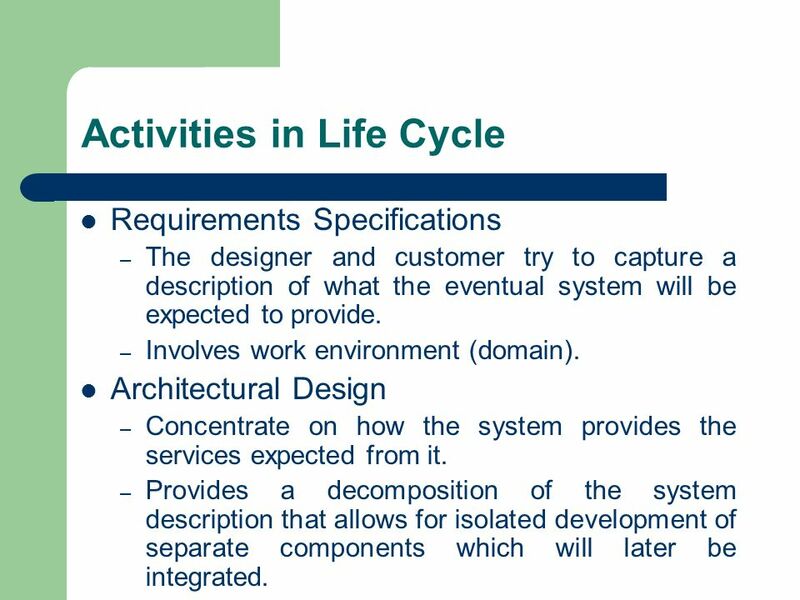 Systems Development Life- Cycle Planning Analysis Design Implementation Design. 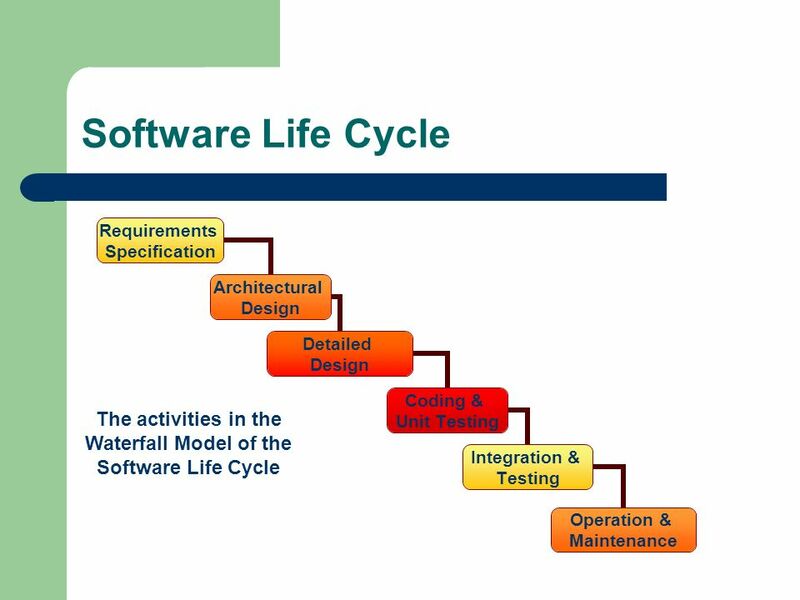 The software process A software process is a set of activities and associated results which lead to the production of a software product. This may involve. SECOND MIDTERM REVIEW CS 580 Human Computer Interaction. CH02: Modeling the process and life cycle Process of developing software (organization and discipline in the activities) contribute to the quality of the. Usability paradigms and principles z Designing for maximum usability is the goal of design z History of interactive system design provides paradigms for. 1 CS 501 Spring 2003 CS 501: Software Engineering Lecture 2 Software Processes. Software Processes Sumber dari : cc.ee.ntu.edu.tw/~farn/courses/SE/ch4.ppt.